As the heart of the home, the kitchen takes the spotlight more than any other room in the house. 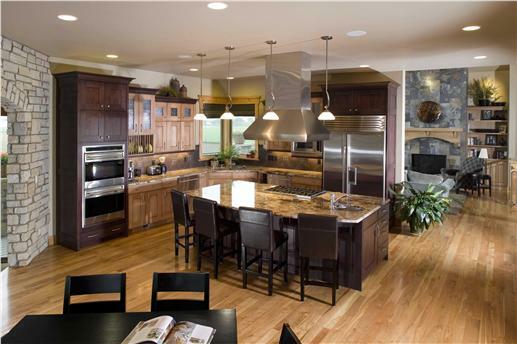 So, when choosing floor plans, the kitchen and surrounding space deserve your time and attention. What could you do to make the kitchen your dream kitchen? We explore today’s most popular kitchen design styles and kitchen floor plan layout ideas -- and how to make them work with your house plans. Two very charming kitchens for today’s modern living with eat-in areas, plenty of cabinets, natural light, and space for family to gather around and “hang out”. On the left top: a luxurious kitchen found in a traditional home (more photos of 161-1040 here) and on the left below: a country-inspired kitchen in a Craftsman style house (more photos of 161-1044 here). What do you have in mind for your kitchen? 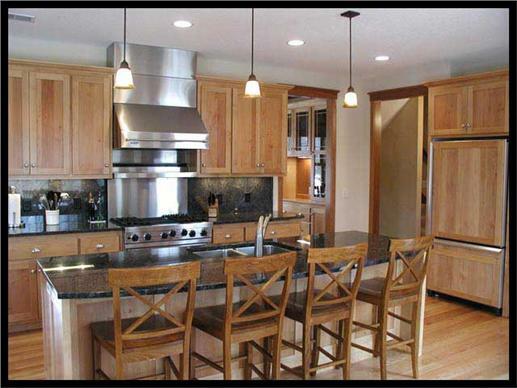 Everyone imagines having a kitchen that is attractive, homey, comfortable, flexible, and at the same time, functional. As the kitchen evolved from a small “no frills” room in the house into the heart of the home, so have the styles, designs, and furniture that define its overall look, appeal, and function. 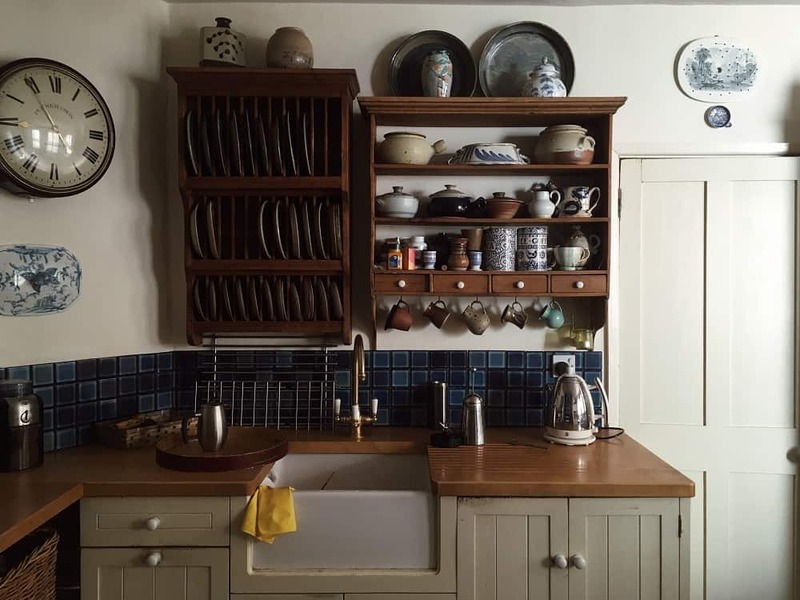 Gone are the days when the kitchen was relegated outside the main house or the cellar. Today, it can be a showpiece for the home; and the center of family activities – cooking, eating, hanging out, entertaining, and even studying. At top, a formal and modern kitchen with an open floor design contrasts the darker shades of the cabinets and furniture with the lighter tones of the ceiling and appliances in this home. Above, another large and open kitchen design with easy access to both the dining and living areas. The interplay of brown/tan/beige tones with the gray in the living room and the entranceway creates a harmonious flow throughout the floor plan for the main level. The low-hanging lights are a great accent. Both kitchens have ample cabinets for storage. So, whether you live in a mansion, a one-story or two-story home, or an apartment, you can have a dream kitchen “makeover” once you decide on a style and a budget. It is important to remember that no matter how big or small the changes are, the kitchen must complement the overall design and layout of the home. If you walk into most homes today, observe that the kitchen is no longer “walled off” from the dining and living room areas. The partitions separating the kitchen from formal dining rooms are coming down to create one “great room” – a huge open floor space where the dining and living areas flow into the kitchen. The open floor plan makes it easier to integrate the whole family --- allowing the “cook” to socialize with the rest of the family and not be isolated in the kitchen area. People still congregate in the kitchen but in the 21st century, it has become a multi-function, communal room. One of the modern accessories – the kitchen island – has now become a work station for busy professionals as well as a study corner for their school-age children. Which Kitchen Layout Fits Your Style? Next to a budget, figuring out the kitchen layout that fits your style is the most critical phase in building or remodeling the kitchen. Space dictates options as well as the primary cook’s preference. Some cooks like a layout that makes the kitchen almost their private domain. The U-shaped design works well for one person; a second person working alongside the cook will crowd the space and restrict movement. This design does not allow a lot of traffic to and from the kitchen and is featured in most apartments, older homes, and small homes because of space limitations. However, there are some layouts where the U-shaped kitchen faces the dining area; therefore, making it easier for family and friends to socialize and share stories. 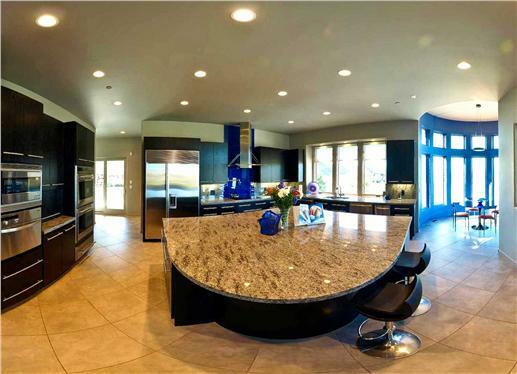 The L-shaped kitchen – the “social layout” - fits perfectly in open floor plans. Because there are no walls here, there is a smooth flow of traffic from one room to the other. For cooks who like to have people around in the kitchen, this is a preferred layout. Family members can easily move from the kitchen to the living room, or even outdoors to a rear patio or a deck. Guests can gather in the kitchen area with ease, share the warmth, smell and taste what’s cooking. With the “no walls” design, an eat-in kitchen or a breakfast nook is a natural and practical touch. Just add a table and chairs… and you’re ready for some cozy, home-cooked meals in the comfort of your kitchen. An added accent to the L-shaped “social layout” is an island. 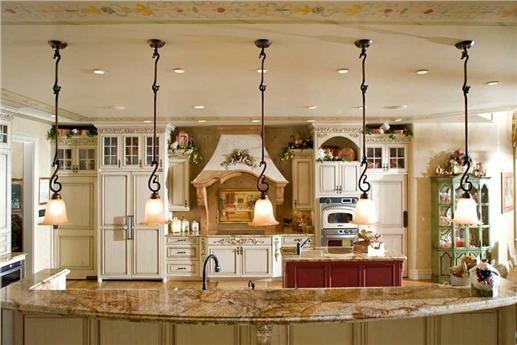 This makes the kitchen more versatile, provides enough entertaining room and allows people to mingle with each other. The island can be both functional and artistic. Some homeowners prefer antique-looking countertops for the island; others like the more modern. Still others choose to have a cooktop on the island, so that they face the family, friends, and guests who are moving about the kitchen area and into the other rooms in the house. This layout expands on the work-triangle design of the refrigerator-sink-cooktop being in close proximity to each other for an efficient working kitchen. With the L-shaped/island layout, appliances are grouped into zones that consider various appliances, fixtures and gadgets in the kitchen. This re-organization gives people in the kitchen plenty of space to move around and do multiple tasks. If you like to be in the center of the action, this layout is for you. 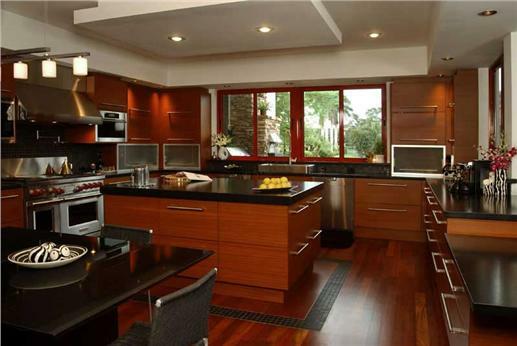 A luxury kitchen (above) with a kitchen island, eat-in kitchen, butler’s pantry, walk-in pantry, nook/breakfast area and a peninsula/eating bar. Below, a kitchen island is the main attraction of the kitchen in this ranch house. 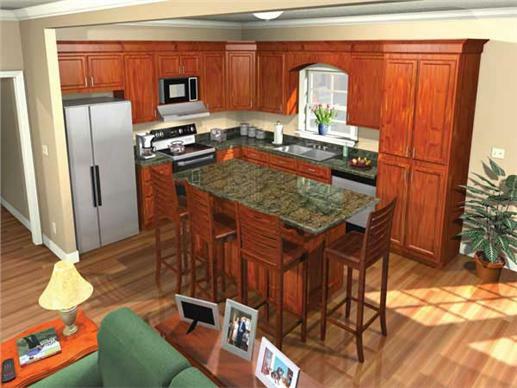 View more house plans with large kitchens here. There are basic/standard appliances in every kitchen. Start with the free-standing range with a combination cooktop/oven, refrigerator, freezer, microwave, toaster oven, and dishwasher. Food processors, blenders, stand mixers, hand mixers, grills/griddles, rice cookers, woks. In most kitchens there are now vent hoods above the cooktop/range to absorb all the heat and gases that emanate from cooking. Modern appliances – stainless steel vent hood, a sink atop the kitchen island, and countertops – add to the classic look of this kitchen. As more innovations and inventive uses for appliances emerge, some of the basic appliances have become “old hat” and sometimes boring. Wouldn’t it be fabulous to have a wall-mounted double oven instead of the standard combination oven/cooktop? With the double oven, two dishes can be cooking at the same time at different temperatures. While on the subject of ovens, add a steam oven that works better than a microwave and does not dry out foods, and a flat-top oven that’s easier to clean and maintain. And, how about a built-in refrigerator side-by-side with a freezer or a chef’s sink? Or a warming drawer with a timer? If you’re a dedicated chef or an amateur cook or a culinary enthusiast, these trendy appliances are sure to make an impression. It’s never fun to think about cost parameters, especially when it involves a dream project and when experts report that a total remodel of a kitchen can cost almost as much as that of a starter home. However, it is always prudent to set a budget and stick to it. Your budget may influence which home features will be prioritized. No reason to despair if there is not a lot of money to spend on the kitchen renovation. Like in most things in life, creativity and imagination can take people places. 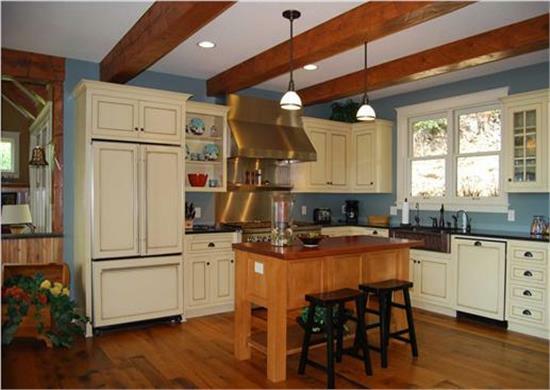 The key is to focus on an area or areas that can give that old kitchen a fresh new look. > Even on a so-called “shoe-string” budget, a kitchen can be transformed from “ho-hum” to bright, airy, attractive and comfortable. Start with a new coat of paint – think pastels, light shades - and extend the paint job to cabinets and drawers, and perhaps, chairs. Put some decorative bowls or jars on top of the cupboards and be creative with the backsplash. > Dress up the kitchen window with new curtains; put plants on the window ledge. > Now that the background has been set up in the kitchen area, invest in a centerpiece furniture that pulls everything together. -- A vintage table – farmhouse, colonial, or country style - surrounded with low-hanging lights or ceiling lamps is a good investment. -- Antique cabinetry like the Hoosier cabinet, which was popular during the early 1900s, or a modern kitchen island with a round sink can work, too. Charming and homey. 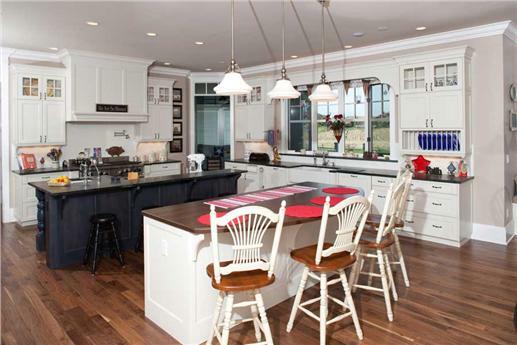 Top: The country features a breakfast nook, a kitchen island and low-hanging lights. Above: Vintage-style shelves in a New England home displays intricate work. 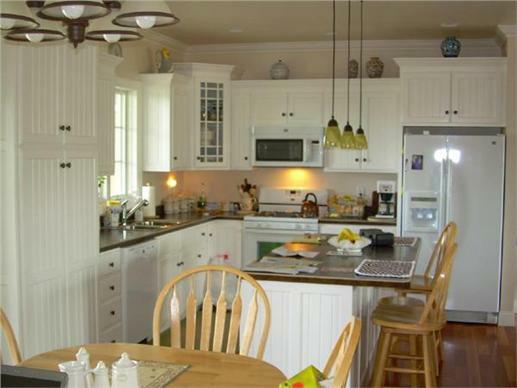 This kitchen’s focus is an antique butcher block island with a wood top (Plan #146-2810). 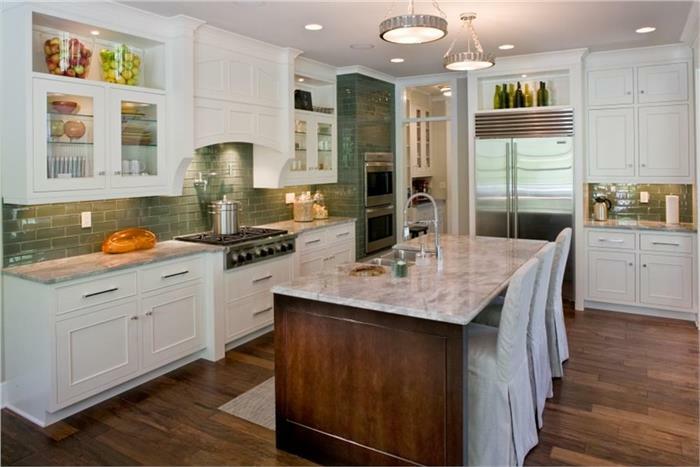 The kitchen’s look takes on a totally different dimension if there is some room to maneuver within the budget. Instead of some “do-it-yourself” work in certain areas, you can call in experts for help. Homeowners with bigger budgets for kitchen renovations have the option of buying trendy appliances and materials for countertops; add kitchen islands and breakfast nooks. They can even install a built-in refrigerator that matches the kitchen cabinetry and furniture; and tear down walls in rooms surrounding the kitchen for an open look. Whatever your budget is for building or remodeling a kitchen, it is always possible to have the kitchen of your dreams… with some imagination and resourcefulness. So, are you ready to start building from scratch, a major renovation, or just a touch up of your kitchen? What is on your kitchen design wish list?